Route. 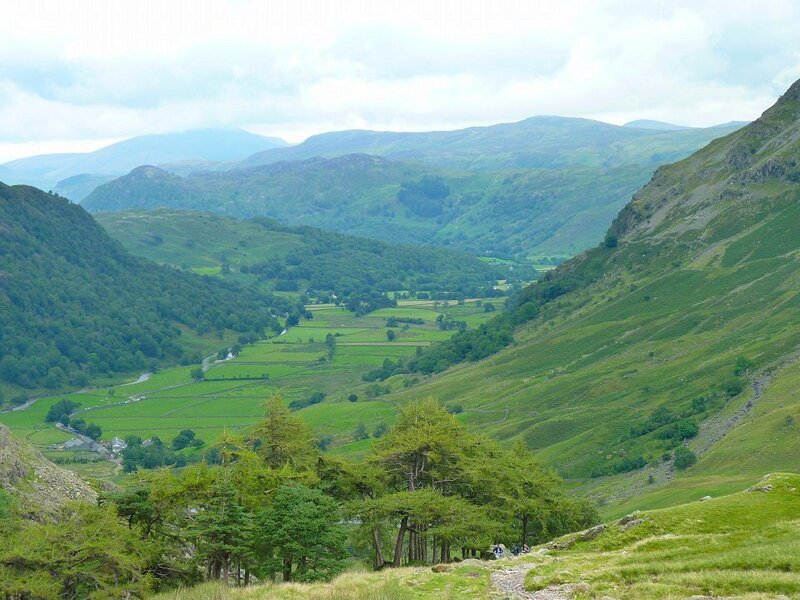 Day 1 Great Langdale - Mickleden - Stake Pass - Langstrath - Borrowdale youth hostel. 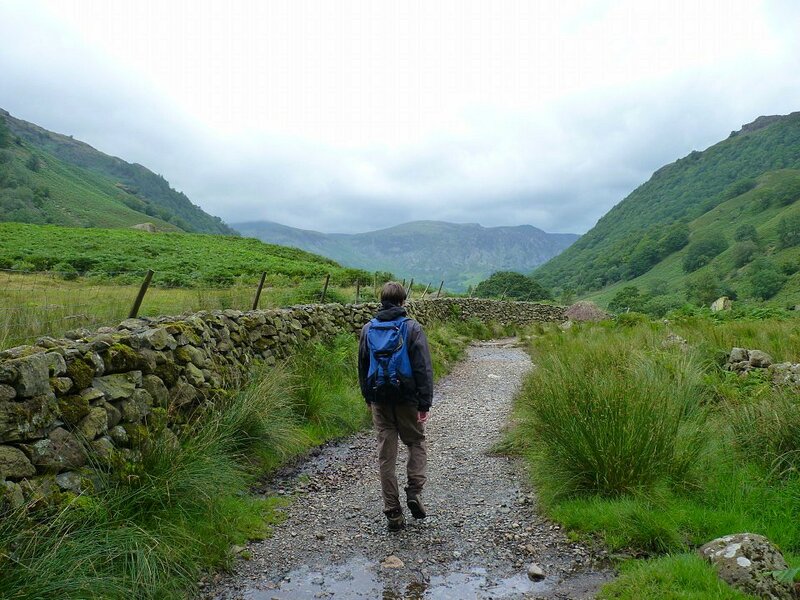 Day 2 - Borrowdale YH - Seathwaite - Styhead - Wasdale Head - Burnmoor Tarn - Boot - Eskdale YH. 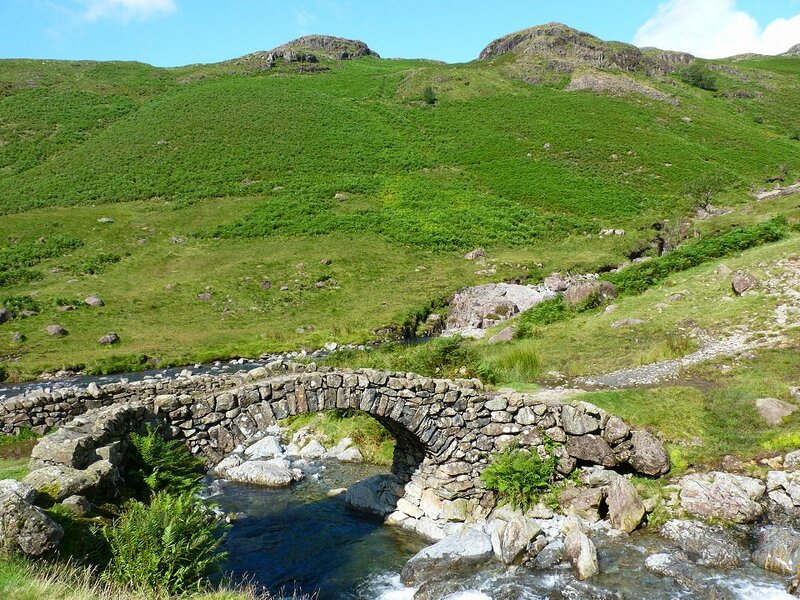 Day 3 - Eskdale YH - Brotherilkeld - Lingcove Bridge - Three Tarns - Great Langdale. 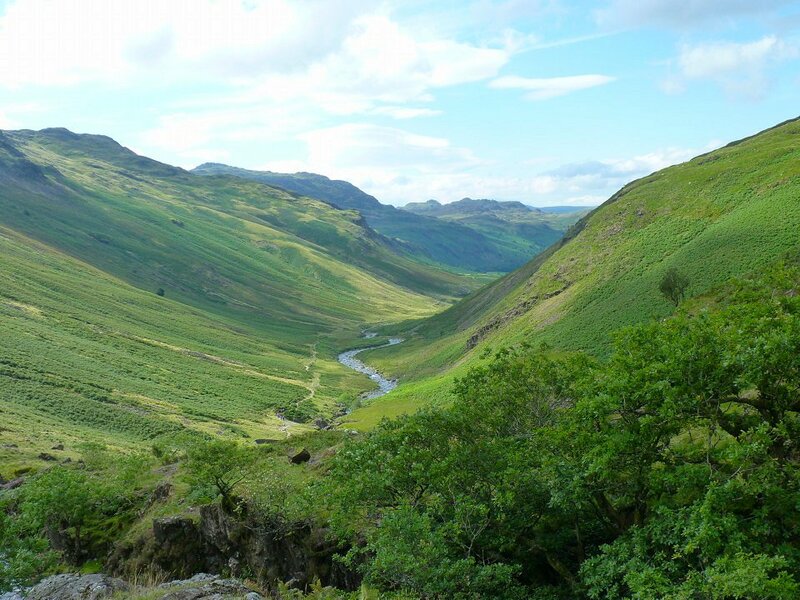 Robert James and I went for a three day (well, two and a half day) walk taking in the valleys of Langdale, Borrowdale, Wasdale and Eskdale. Setting of from Stool End. We walked up the West side of the river for a change. We are headed for Stake Pass which is the low point on the right at the head of the valley. Looking back down Mickleden. Mickleden Beck was quite wide and we only just got accros with dry feet. Small waterfall in the beck. The boys look for a place to cross. 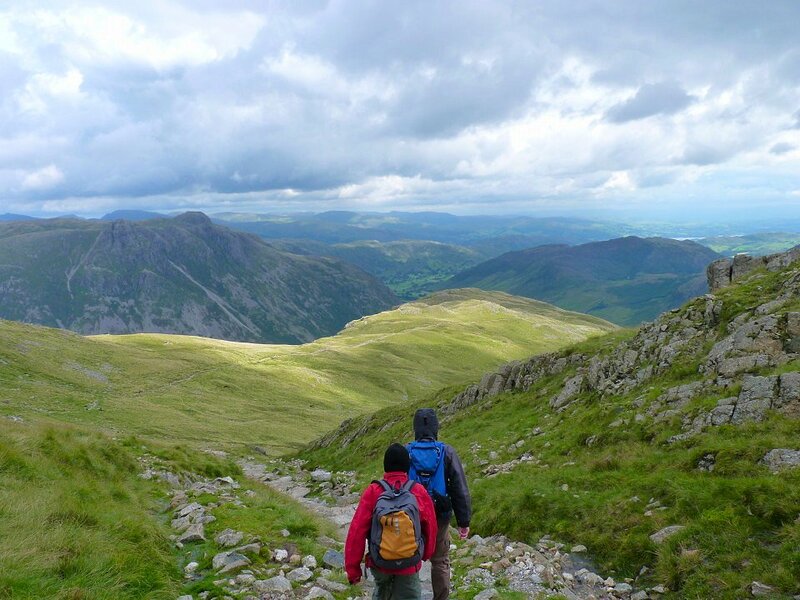 After an easy climb up the zig-zags of Stake Pass we cross Langdale Combe. 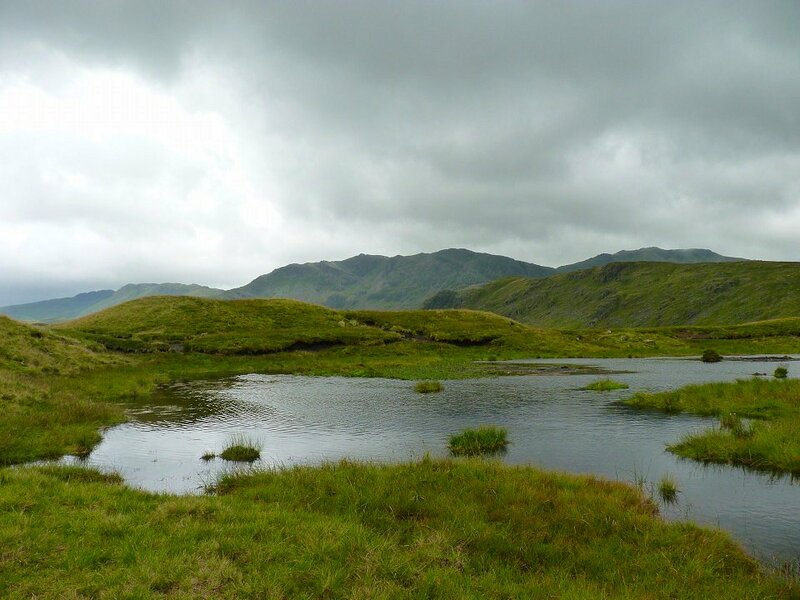 This little tarn is just above the path on the left and could be easily missed. 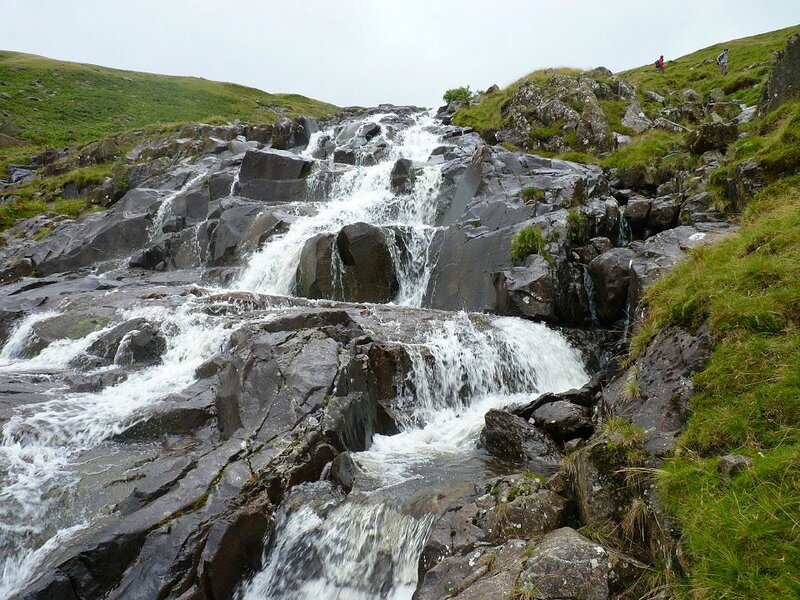 More waterfalls on the way down into Langstrath. 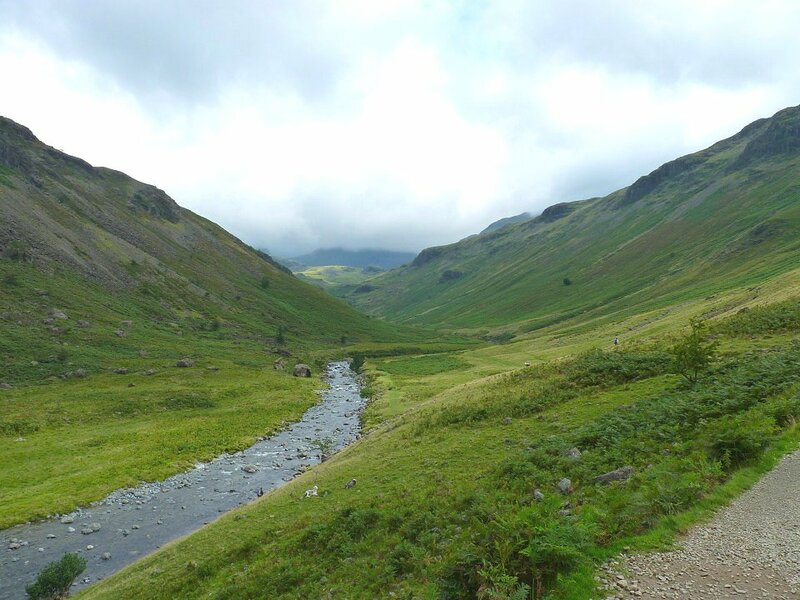 Langstrath means "long valley" and it can feel like it at times. 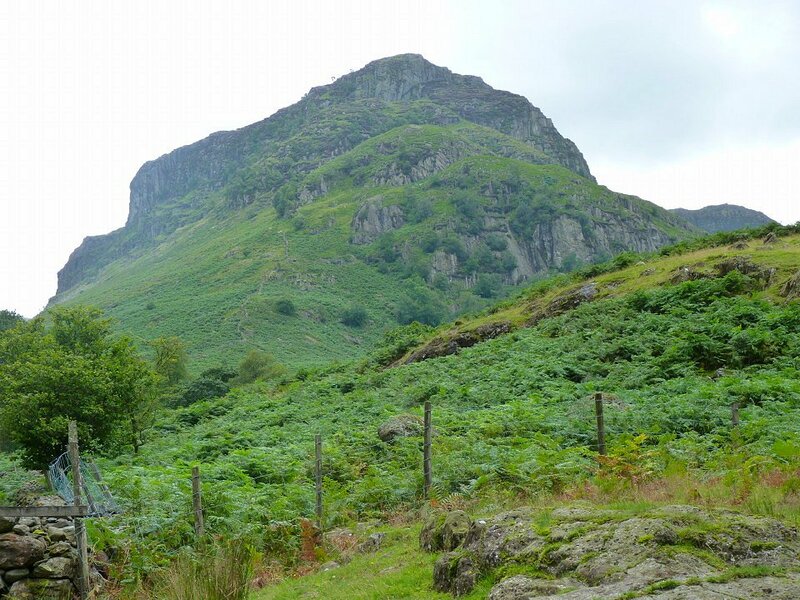 The great bulk of Eagle Crag marks the end of the valley. 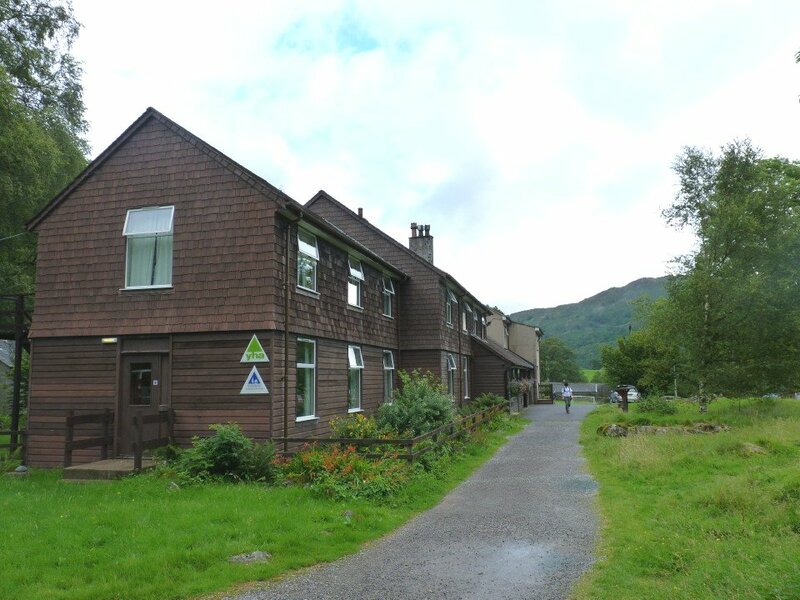 Leaving Borrowdale YH the next morning and again the weather is fine to start with. Looking back the way we have come from near the top of the Styhead path. Robert waits for us slowcoaches at the Styhead stretcher box. 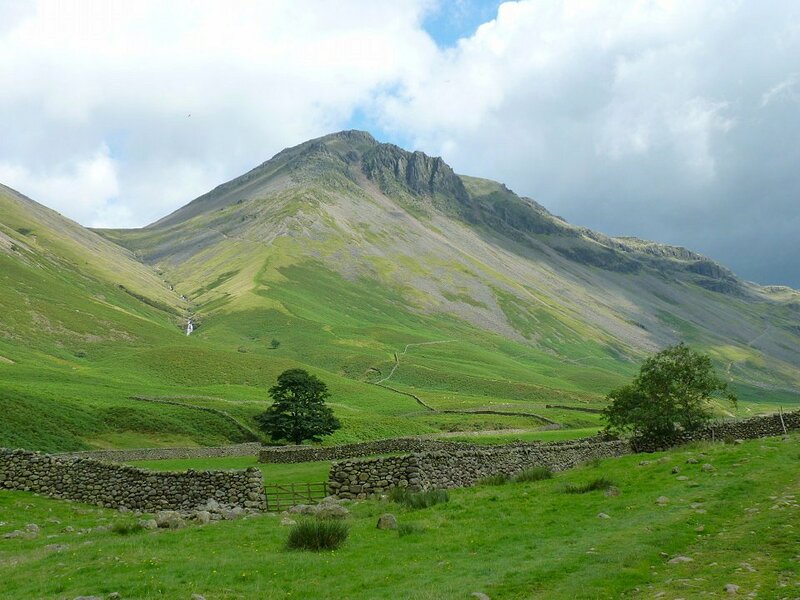 Lingmell is the fell in the background. 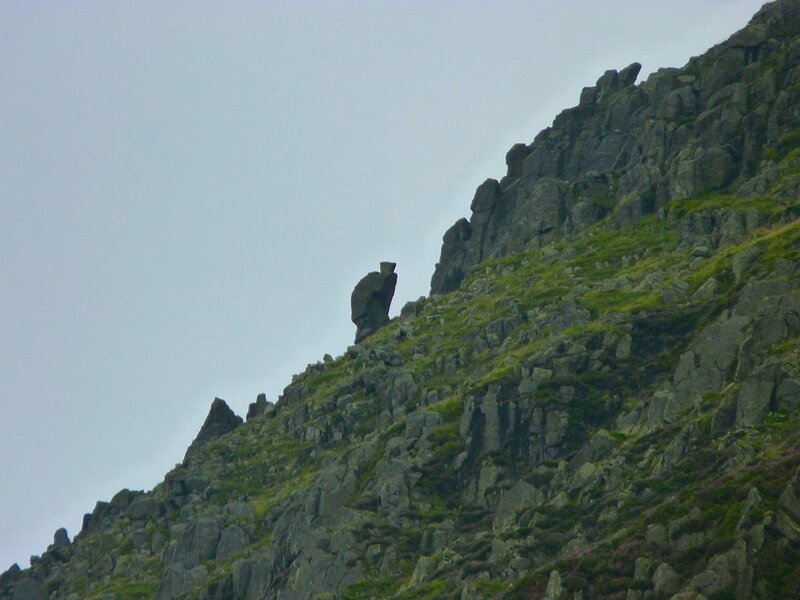 Looking up to Napes Needle from the path down to Wasdale Head.. 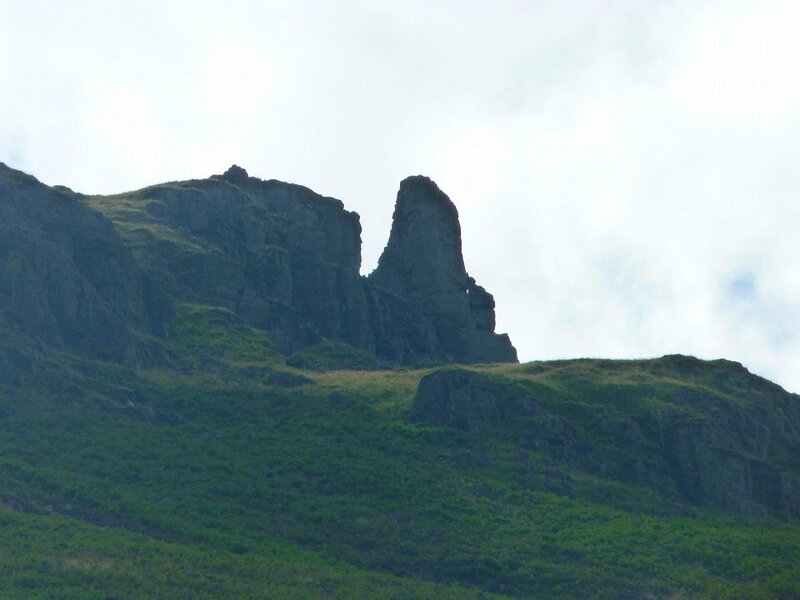 The sphinx or cat rock from the same place. Looking up at the rocks reminded my of last time I was here when I got I closer view. 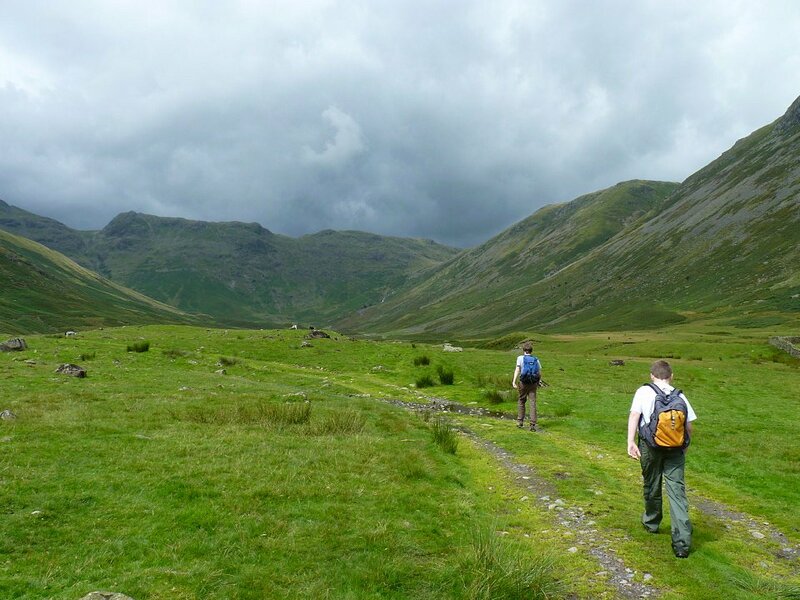 Nearly at Wasdale Head were we had lunch in the pub whilst a heavy rainstorm passed over. 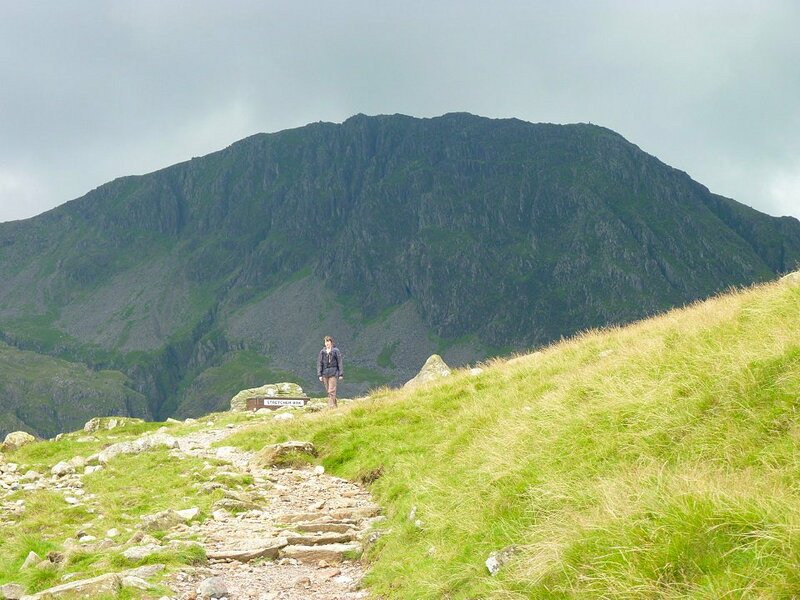 Looking back to Great Gable. 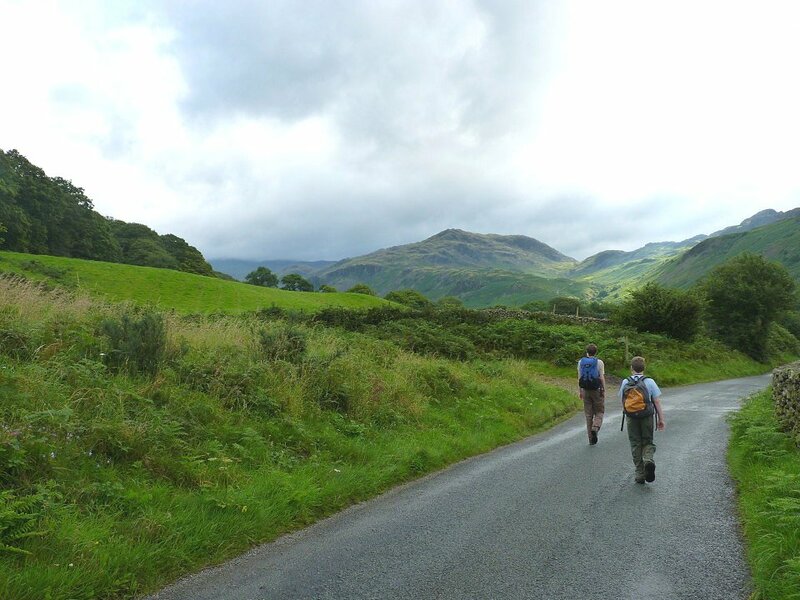 After our lunch we set of up the corpse road to Eskdale. 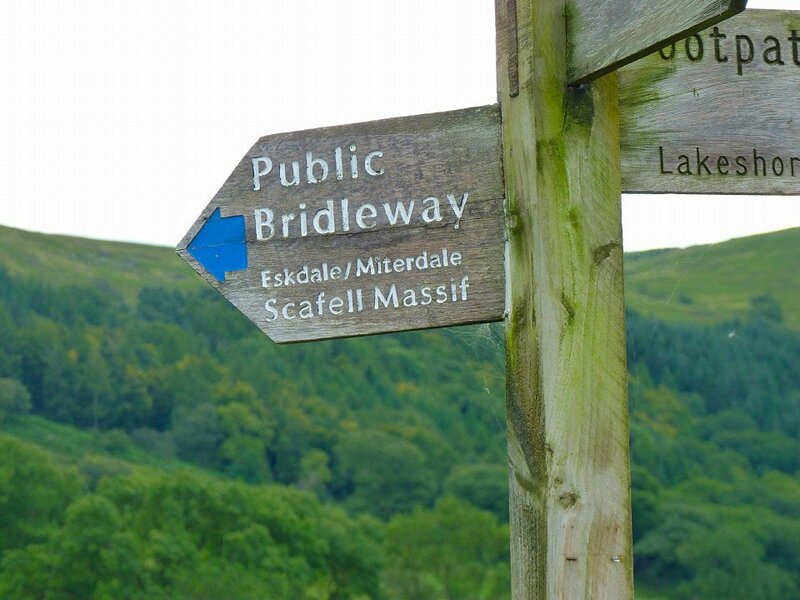 This sign is correct Scafell does look "massif" from here. 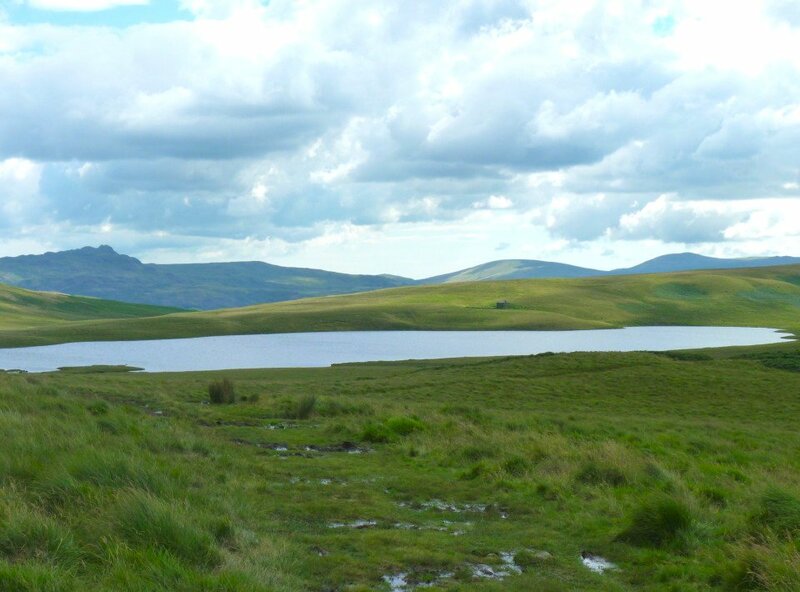 Burnmoor Tarn. The rain caught us here and we got a bit of a soaking for twenty minutes, but were soon at the youth hostel and could dry off. 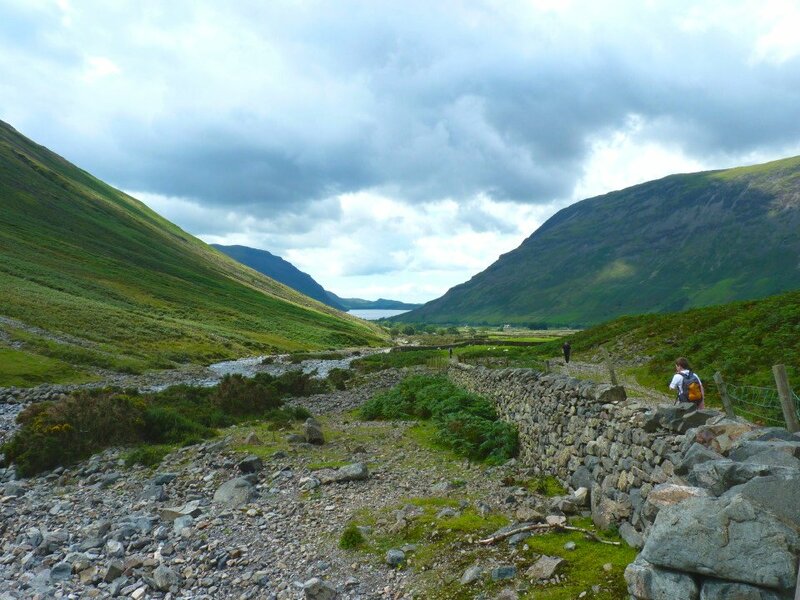 The path along the river Esk is a lovely way to access the real hart of the Lake District. 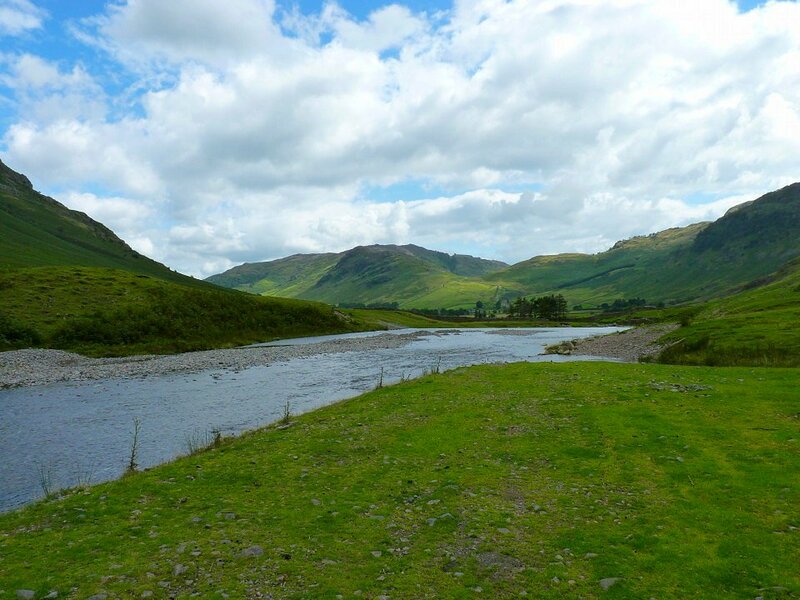 This is looking back to Brotherikeld. And this is looking up the valley. The skies are brightening but the cloud is still hanging around. 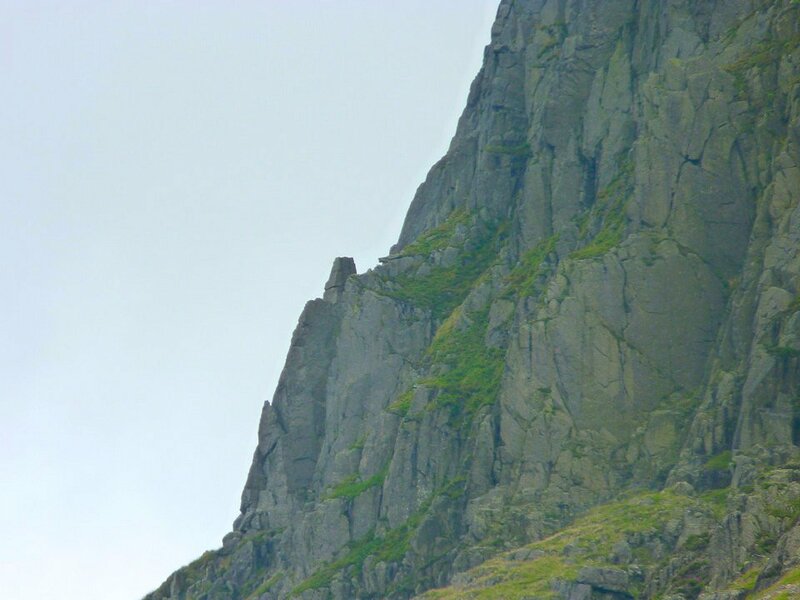 Eskdale Needle on the flank of Hard Knott. 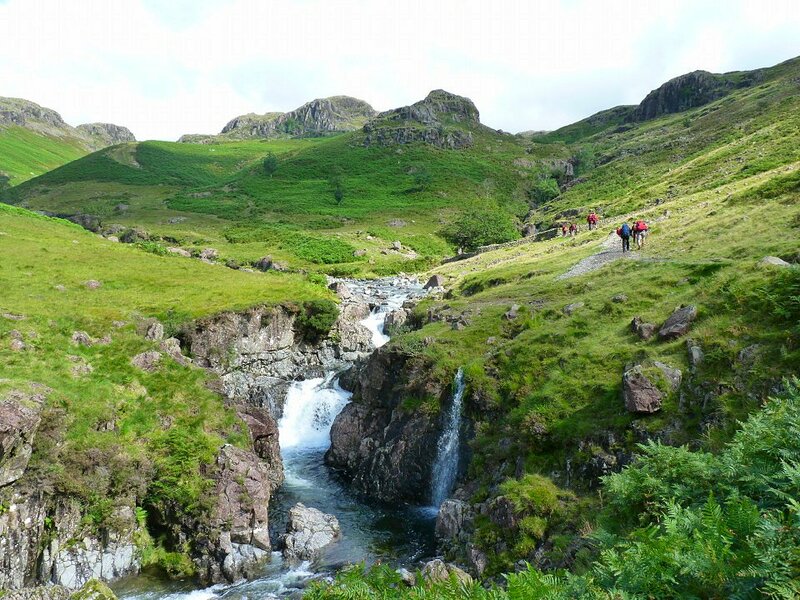 Lovely waterfalls near Lingcove Bridge. 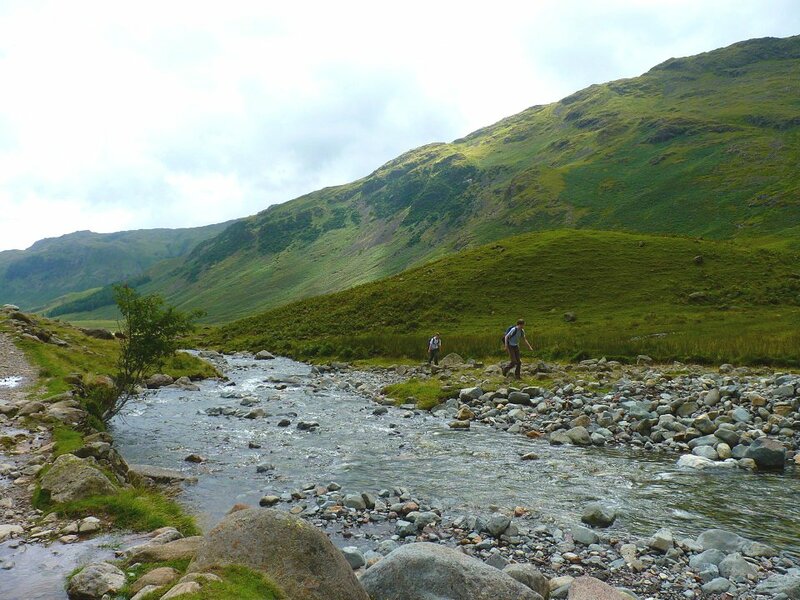 Looking back down the Esk. 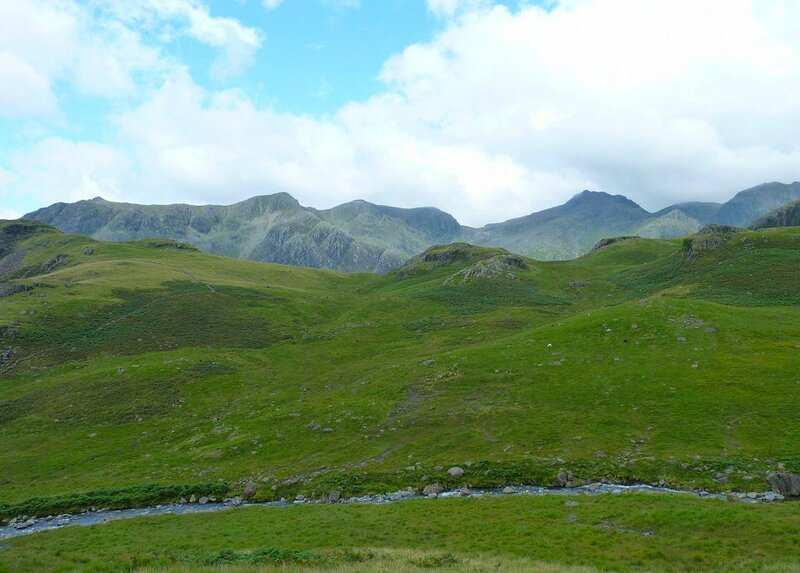 The Scafell range seen from the path above Lingcove beck. 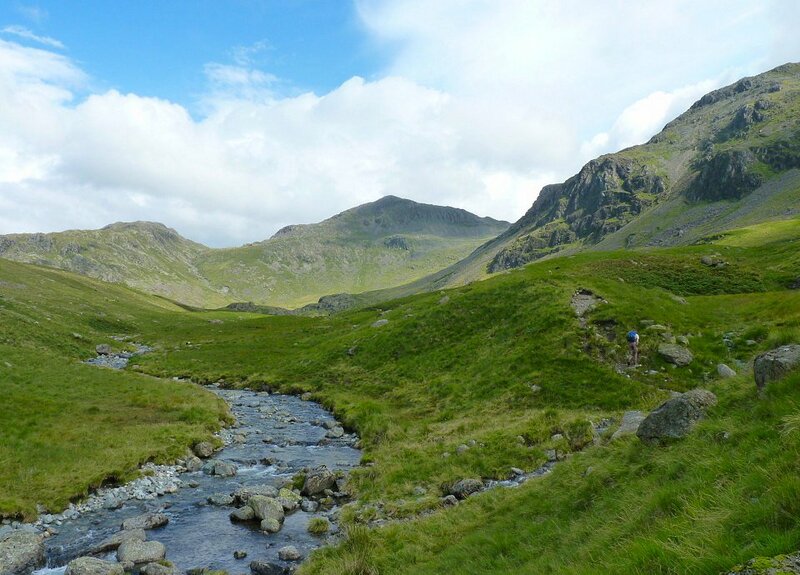 And looking up to Esk Pike on the left and Bowfell on the right. 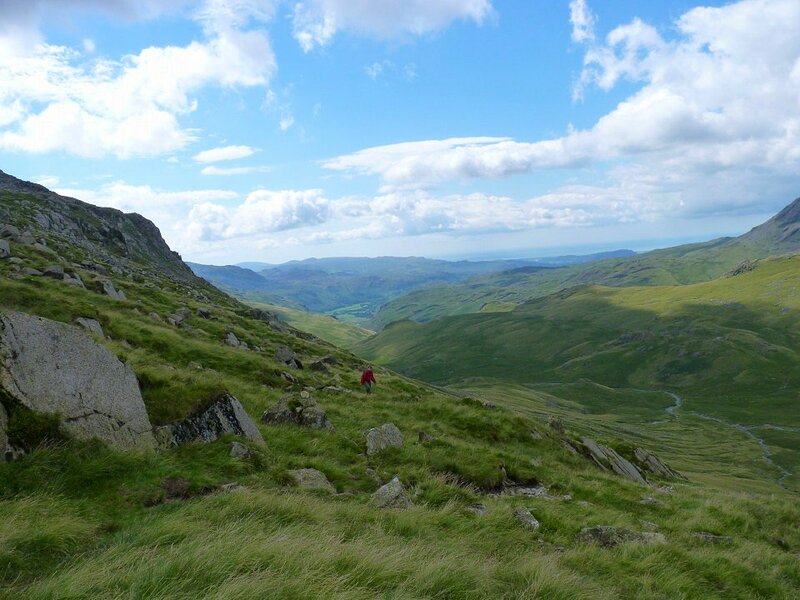 Our path took us across the fell and up to Three Tarns. 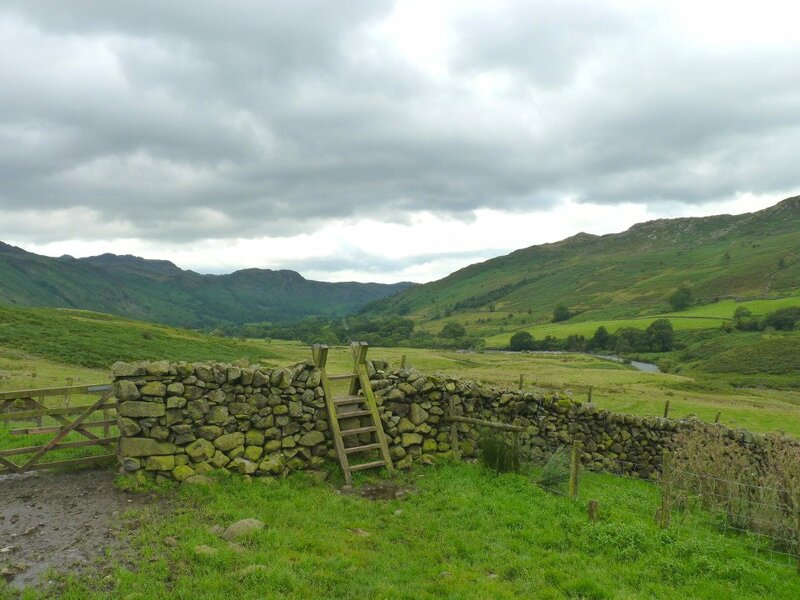 The green fields of Eskdale can just be seen in the distance. 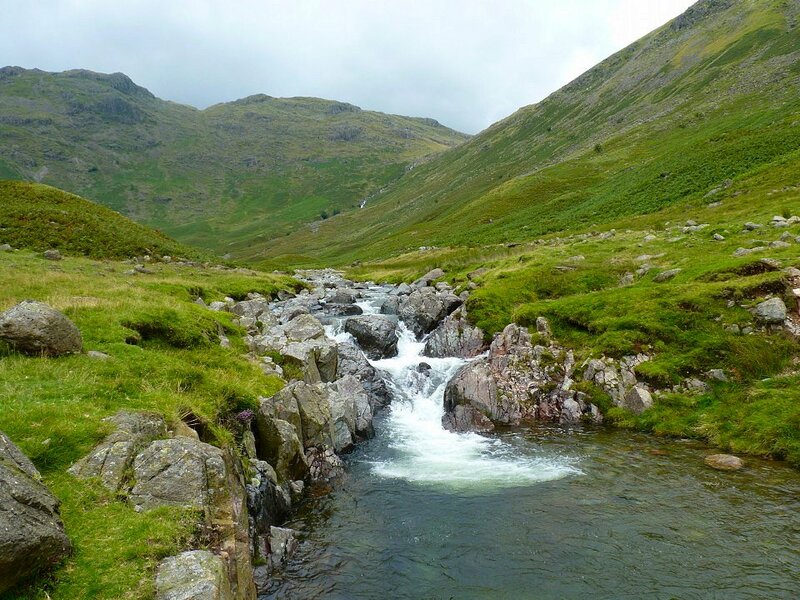 Setting of down the Band which would lead us back to Langdale..